The Flames could leave Calgary if a new hockey arena isn't built, the team's president of operations said, also urging tax breaks for Canadian players to make northern NHL teams more competitive. 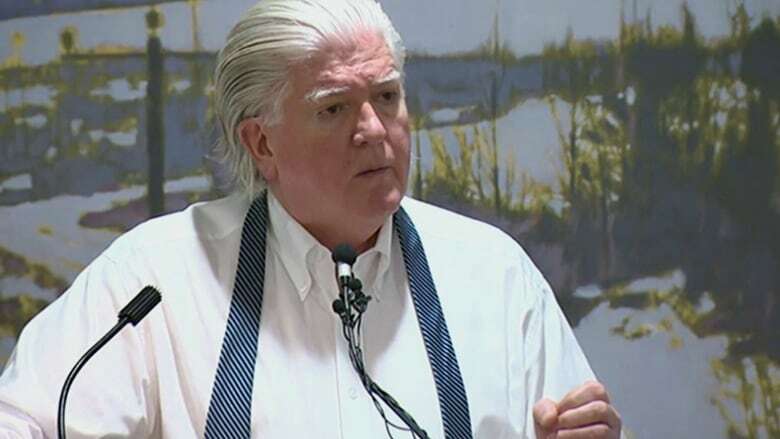 Speaking to a crowd at the Canadian Club of Calgary, things got heated when an audience member and longtime season ticket holder questioned Brian Burke on the team's pursuit of public money for a new arena and suggested there was nowhere for the team to go. "You don't think we could find a place to go? With a straight face you're saying that. Let's see. Quebec. Oh yeah, they have a brand-new building that meets NHL standards," Burke said to Chris McCrae. "Quebec. OK, you just said we had nowhere to go?" When pressed by McCrae on why public dollars should be used to finance an arena for the team, Burke said, "I think most intelligent people get this. Sorry … my learned friend." Prior to that exchange, Burke argued for publicly funded professional sports arenas. He said the reluctance of Canadian cities to spend on professional sports puts them at a significant disadvantage. "In the U.S., it has long been acceptable to use public money to construct arenas and stadiums. It's long been acceptable to give a pro team a favourable lease based on the benefits pro teams bring to the marketplace," he said. Ken King, the president and CEO of the Calgary Sport and Entertainment Corporation, which owns the Flames, downplayed Burke's comments. "Brian Burke runs hockey operations for the Calgary Flames and he and many Calgarians have strong views about this topic," he said in a statement. "However, he is not our spokesperson regarding a new events centre for our city. We remain committed to our dialogue with the city and very optimistic we will get to a positive conclusion. We admire everyone's enthusiasm on this subject." Mayor Naheed Nenshi told CBC News he sees Burke's comments as posturing and a negotiating tactic. The Flames have been gunning for a new arena in the city for years. The proposed CalgaryNext complex — that would include a public fieldhouse and CFL stadium in the West Village, was effectively killed by city council, which voted in favour of a "Plan B" stadium near the existing Saddledome. Burke said he's optimistic a deal will be reached in the near future for a new arena in Victoria Park. He said that with the impending opening of Detroit's new arena, Calgary will have the oldest building in the league by more than 10 years. New York City, which technically has the oldest arena in the league, spent $1 billion to essentially rebuild Madison Square Garden. "Frankly, when we put out CalgaryNext, I was personally amazed the city didn't say, 'Thank you, let's do it,'" he said. Burke said the proposed project would not only have changed the face of downtown Calgary for the next 100 years, the fieldhouse would have also filled the No. 1 recreation need in Calgary. Burke said additional challenges Canadian teams face compared with American professional sports teams are the exchange rate and taxation. "The playing field is far from level," he said. Because all players in the NHL are paid in U.S. dollars, Burke said, a $72-million US salary cap equates to over $100 million Cdn. "Right there you've got a situation where $30-million potential profit or potential use of funds for operating expenditures is wiped out," he said. The higher taxation rates in Canada are also unfair for NHL players on Canadian teams. Burke said he believes athletes should be eligible for some sort of tax break. "These guys make big money but they have short careers," Burke said. "If you're a doctor, you might make a good living for 45 years.… We're going to have to figure out how to tax the athletes equitably for the Canadian teams to be able to compete.